All 10 episodes will be available for streaming through Netflix beginning September 2. Narcos, Netflix’s drama about the DEA’s hunt for Pablo Escobar during the height of Ronald Reagan’s war on drugs, has a unique equation to solve in its second season. 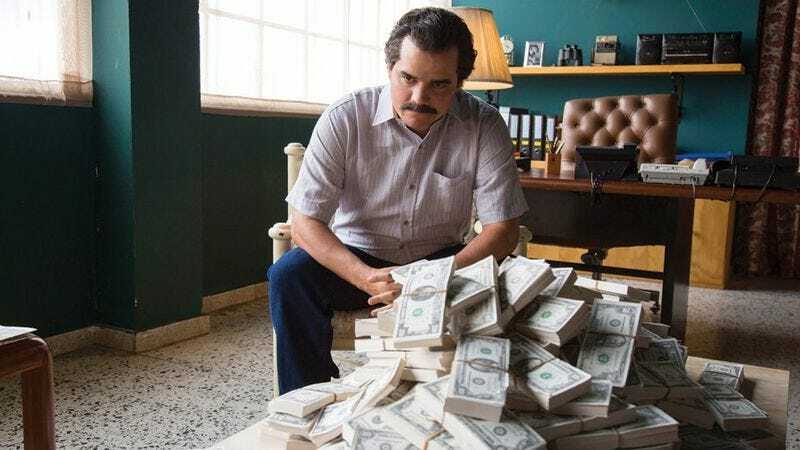 On one hand, the show is in a better narrative position than it was in season one, with the noose tightening around Escobar (a magnetic Wagner Moura) and his impending death lending a greater sense of urgency than in the first 10 episodes. But the producers have stressed both their commitment to factual accuracy and their interest in continuing the show after Pablo Escobar is out of commission. So how does Narcos faithfully tell its true story while preparing to lose its leading man and its most compelling character? Based on the first five episodes of season two, the plan is to approach the story as if there’s nothing to hold back. The Escobar saga is lengthy and complex enough that it could fuel multiple seasons if newly installed showrunners Eric Newman and Jose Padilha so chose, and the first season ended on a muted note that suggested a willingness to pad the story with stylish but meandering detours. But the latest 10-episode batch represents Narcos with its brake lines cut—more brisk, more satisfying, and free of the responsibility to lay expositional groundwork. If for no other reason than the paring back of too-clever narration by lead DEA agent Steve Murphy (Boyd Holbrook), Narcos is becoming its best self in its run up to an extreme makeover should Netflix re-up. Narcos’ first season chronicled the first 15 years of Escobar’s rise to infamy, and the season picks up in 1992 after Escobar’s prison escape and only covers the last year before his murder in 1993. It’s difficult to overstate how different Narcos feels without the temporal sprawl, how it feels more epic after radically reducing its scope. 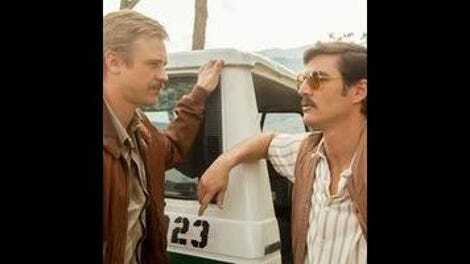 Every scene feels consequential and there’s less scrutiny on the personal lives on the lawmen on Escobar’s trail. With a tighter focus on Murphy and his Colombian partner Javier Peña (Pedro Pascal), there’s less time spent with Murphy’s displaced, long-suffering wife Connie (Joanna Christie), easily the show’s weakest element. There’s still quite a bit of attention paid to Javier’s libertine lifestyle, but that’s more germane to the story, with Javier continuing his practice of seducing leads out of cartel-affiliated Colombian bombshells. Even with less ground to cover, Narcos is pleasantly dense and steadily introduces intriguing new characters to fill its impending power vacuum and firm up the show’s historicity. One of Escobar’s most dogged antagonists in season one was Horatio Carrillo (Maurice Compte), the leader of an elite police task force with the sole task of bringing Escobar to justice, who is fictional but based on the real-life Hugo Martinez. Season two dramatizes the actual Martinez with the addition of the charismatic Juan Pablo Shuk, and also introduces Gilberto Rodríguez Orejuela (Damián Alcázar), the leader of a brutal drug cartel that is to Cali, Colombia what Escobar’s organization is to Medellín. Those are just a couple of the new cast additions that make Narcos more than a high-stakes game of cops and robbers as the show examines how the Colombian power struggle permanently altered the country’s culture. While Narcos has always tried to create a morally ambiguous world, it’s also come down squarely on the side of law enforcement, framing Escobar as a murderous tyrant who, despite Moura’s top billing, is more big bad than antihero. And yes, Escobar was indeed a murderous tyrant who ordered the death of countless Colombian cops during his reign of terror. But in a television format, the audience spends a lot of time with Escobar, and last season Narcos made the mistake of spotlighting Escobar without granting permission to root for or empathize with him. That’s not the case in season two, which slashes and burns Murphy’s once-incessant narration, thereby allowing viewers to consume the story without the forced perspective and choose their side accordingly. While the show never soft-pedals the havoc Escobar created, it makes him surprisingly sympathetic, thanks in part to Moura’s shrewd, affecting performance. Murphy and Peña are more determined to take down Escobar than ever, and it’s not long before their obsession blinds them to the personal and professional costs. Moral complexity is among the touchstones of contemporary television storytelling, and Murphy and Peña’s quest becomes more and more complicated as it aligns them with people like Hugo Martinez, who share their goal but not their methods. Extending Narcos beyond season two seems like a mistake, in part because Moura’s performance provides the show’s gravity and its sense of purpose. But perhaps there’s way more story to be told. After all, Escobar didn’t invent the cocaine trade, he just perfected it, much as the producers of the show about his life have found a way to make their product considerably more potent.